a thing of beauty. i really need the soundtrack which i should have bought when i went to see it but i might go and buy it from them. okay so Bend it Like Beckham is a 2002 movie starring Parminder Nagra, Keira Knightley and Jonathan Rhys Meyers. it’s a British comedy about this South Asian girl (she is Sikh) who wants to play football and joins a women’s team but her parents are strict etc and it’s about her trying to live her life but also obey her parents so the mix of British culture with Asian culture and multiple identities etc. Also there’s a lot about David Beckham because that was when he was super famous. 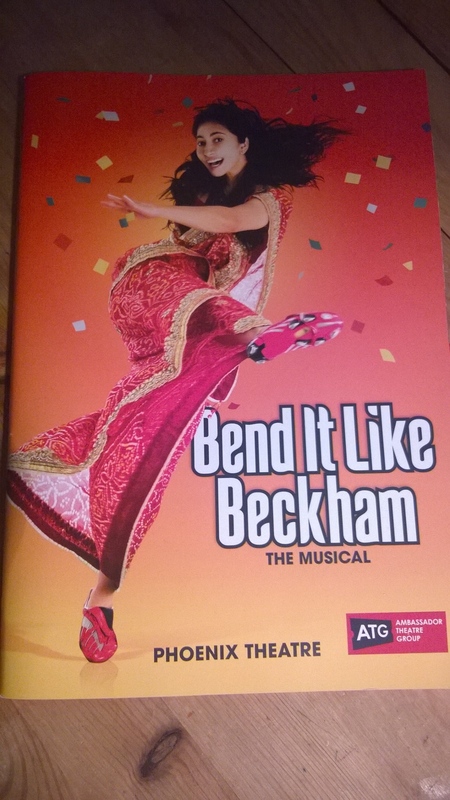 so when i found out it was a musical i immediately wanted to see it because BROWN PEOPLE ON STAGE…AMAZING. some advice when booking theatre tickets: ALWAYS TRY AND GET THE STALLS seats coz they are the best seats. i managed to get some really good seats so we had a perfect view and thankfully no one tall sat in front of us. so i BOOK YOUR TICKETS ASAP for the day after my last exam so it was a celebration of THE END OF UNIVERSITY FOR ME and just a lovely night out with my mum. it is also directed by Gurinder Chadha aka the same woman who directed the movie!!! me: he plays joe in the play! he’s an actor! me: no i dunno what to say….. BUT WHEN I WENT TO SAY HI HE WENT BACK INSIDE! Anyways then the show started and we were swept into the world of 2001 Southhall (West London) and just wow it was incredible. The singing, dancing, acting everything was just wonderfully brilliant. the truth is..i haven’t actually been to Southall (yet) but i live in an area of London that is FULL of South Asians and many other people since it’s a really diverse and ‘multicultural’ area so i can totally imagine it! it was so refreshing to see such diversity ON STAGE in all sorts of clothes all singing and dancing. the set was stunning…they managed to capture the beauty of the high street and the typical desi home as well as the park and football pitch. The acting…the girl who plays Jess Natalie Dew she’s so cute and what a great actress! And the football team…their musical skill combined with football skill and just choreography was brilliant. her parents and family and just AHHH I LOVE IT SO MUCH!!! And Jamie Campbell Bower was also really good. it was really funny coz at the end they were all doing this desi dance and seeing him do that was hilarious. my fave thing was that i saw someone wearing hijab on stage…like…wow…TALK ABOUT REPRESENTATION!!! i had to give them a standing ovation it was just so wonderful. it’s actually better than the film because DANCING AND SINGING!!! Seriously I highly recommend going to see this if you can! Also we met the director after and told her what a spectacular show it was and she was really happy. 10/10 would see again. The programme is only £4 which is really cheap so defo get that! I tried to meet Jamie Campbell bower by the stage door but he ran off to have a cigarette lol. Oh well, at least i saw him.